The Asheville Mural Project, a program of Arts 2 People, exists to beautify and diversify Asheville’s urban landscape, providing artists and local community members with the opportunity to implement their own public art. AMP believes that murals enhance quality of life and create an artful metropolitan experience through the transformation of conventional architecture. The murals are both the testimony and celebration of a lively local arts culture. AMP is making Asheville a city where the mural arts are celebrated and has joined forces with local professional muralists to create the highest quality art which will serve as lasting monuments. This is testified to in a recent article from Kent Ohio point directly to inspiration from AMP’s Lexington Gateway Mural for the making of their own city mural. Read below for more info a new mural that was just comissioned by The Cotton Mill Studios in Asheville! 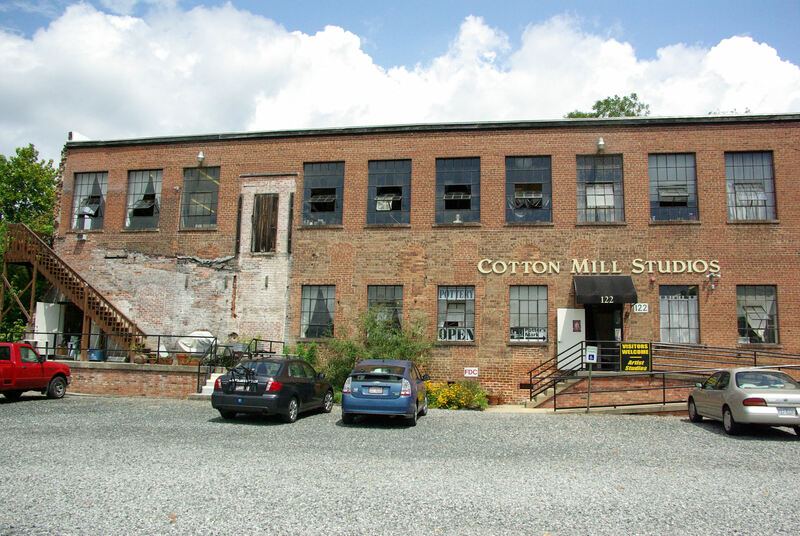 The Historic Cotton Mill Studios, located in the River Arts District of Asheville, NC is what remains of the Cotton Mill Complex which was destroyed by a devastating fire in 1995. The building was purchased by potters Eileen & Marty Black (The Potter’s Mark Ltd.) in 2002 and is the home to nine artists. The North side of the building indicates where the fire stopped, burning up to the wall. The building was saved both by an operating sprinkler system and a shift in the winds away from the building. Unfortunately, this was the view [Left] of the River Arts District to passersby’s on the Smokey Park Bridge over the French Broad river. 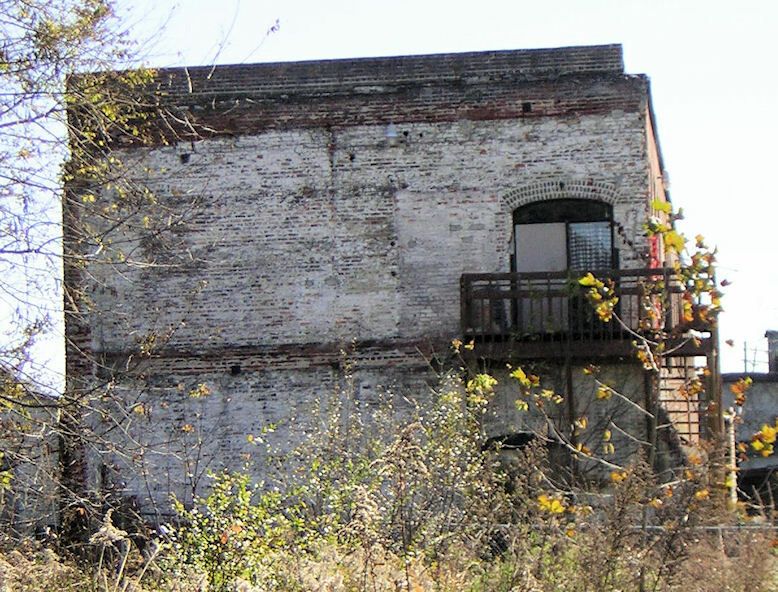 It made the River Arts District look like a burned out slum. 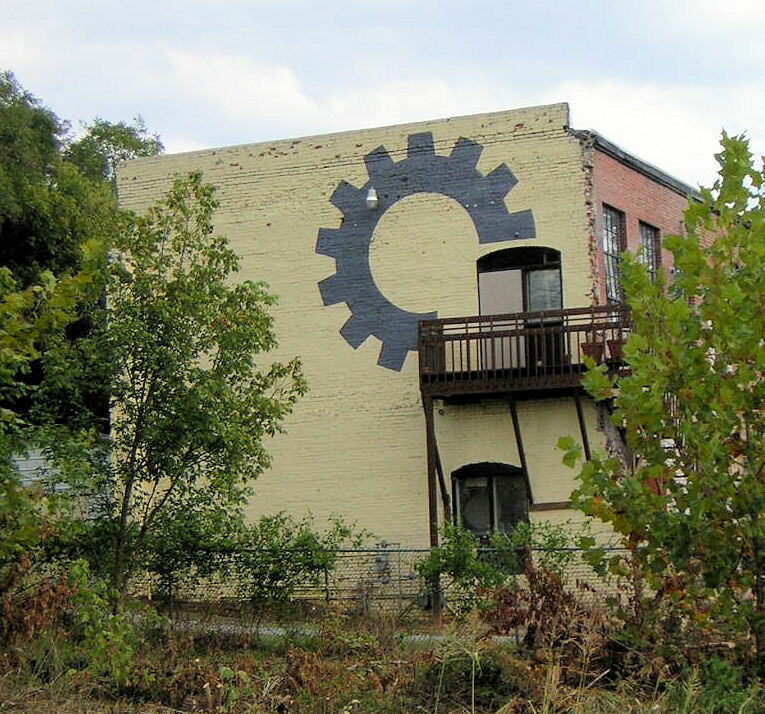 After Purchasing the building Marty & Eileen began a facelift to improve the image and Identity of the River Arts District. They started by cleaning and painting the burned out side wall so the view from the bridge would be more appealing, hopefully attracting more visitors to the area. The mural symbol they added to the building now identifies the River Arts District. [left]. The front of the building [below] also showed signs of the devastating fire and, after many years of looking at it, Eileen and Marty decided that it also needed a facelift. Investigating many possibilities the Blacks decided on a mural, but not just any mural, they wanted a “Trompe l’oiel”. Trompe l’œil, (French for ‘deceive the eye’, pronounced [tʁɔ̃p lœj]) is an art technique involving extremely realistic imagery in order to create the impression that the depicted objects appear in three dimensions. Ian Wilkinson the Mural Program Director of the Asheville Mural Project, a program of Asheville’s non-profit Arts 2 People came up with the ideal solution. This mural [rendering shown below] should be completed by mid-October 2010. Eileen and Marty hope that this will become a landmark and the beginning of many similar murals on the old buildings of the river Arts District (RAD), resulting in attracting many more tourists to Asheville and the RAD. 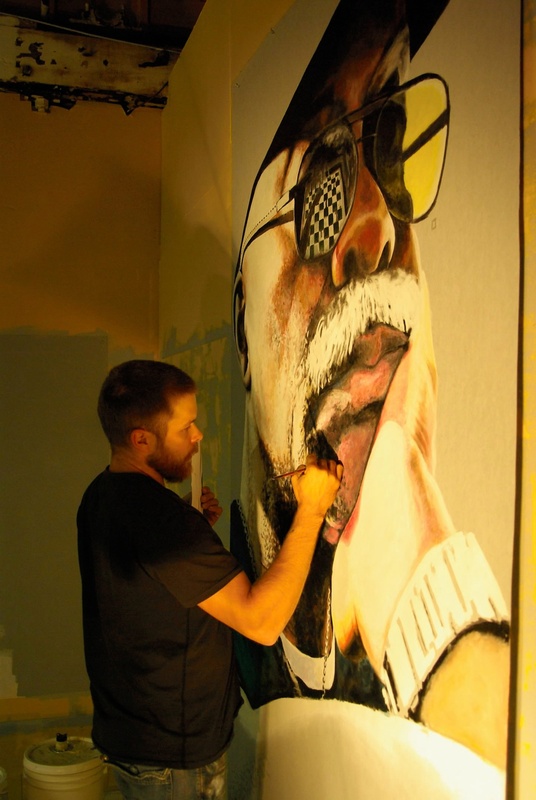 About AMP’s Director: Ian Wilkinson has been a professional muralist for fifteen years. He was the lead mural artist for the Holocaust Museum of Virginia. Ian painted murals depicting the Ipsen Family’s escape from the Holocaust, and worked directly with other Holocaust survivors to make detailed drawings that would be used to recreate key points in the museum. Ian went on to earn his BFA in painting from Adams State College in Colorado. Ian shows his personal work in Santa Fe and private collections across the country. Ian specializes in portraits, realism, and large format work. He is currently the Director of the Asheville Mural Project (AMP), which is a program of Arts 2 People. Ian lives in Asheville with his wife Angeline, daughter Ella and son Augustus. It is AMP’s goal to make murals an affordable and lasting solution for beautifying and revitalizing buildings, homes, and businesses. The AMP team works closely with clients in the proposal phase of the project. AMP works hard to meet budgetary requirements and navigate the permit processes. All works are created using state-of-the-art materials. The AMP team offers a number of different service agreements for clients to assure our works will stand the test of time and weather. AMP also specializes in child directed murals and offers free lectures and workshops. To find out more about AMP, please visit http://www.arts2people.org/amp.html or email Ian Wilkinson at info@ianthepainter.com. Asheville Mural Project’s Lexington Gateway Mural: A Sneak Peek ! Asheville Mural Project: A Sneak Peek! Arts 2 People has officially announced a sneak-peek event unveiling the finished “Chess Players” piece of the Lexington Gateway Mural destined for the Broadway/Merrimon side of the project. The mural for the Broadway/Merrimon side has been done using a technique known as merouflage, painting on cloth, and will be hung to be viewed for the first time at Grace Studios for the event. The $25 event ticket includes catering by Mela and locally crafted beer from the Lexington Avenue Brewery, and one raffle ticket for a beautiful piece of furniture donated by Terra Nostra Decor. Entertainment by members of Seduction Sideshow and The Pond Brothers. The muralists will be present to meet and greet supporters. All proceeds from the event will be used to complete the mural! The Asheville Mural Project , a program of Arts 2 People , exists to beautify and diversify Asheville’s urban landscape, providing artists and local community members with the opportunity to implement their own public art. Murals enhance quality of life and create an artful metropolitan experience through the transformation of conventional architecture. The murals are both the testimony and celebration of a lively local arts culture. They are working to complete a section featuring two chess players engaged in play. The inspiration for this work comes from two gentleman that play in Pritchard Park daily in the warm months. The idea is to celebrate and sort of deify these two fellows for being a fundamental but potentially overlooked aspect of Asheville’s Downtown culture . It is a goal of our artist designers to accentuate things that are defining elements of Asheville. The large format of our public works is a great way to magnify important things that normal passersby might miss. The opposing mural on Merrimon’s west side will celebrate our agricultural importance, viability, and how sustainability is an important part of Asheville culture. This mural designed by Trish Tripp , and Melissa Glaze is underway in our studio in the River Arts District. Recently the mural project as a whole has switched mural techniques . The first half of the project was completed using a more traditional approach of painting directly on the surface of the bridge. Now we have adopted an old technique called marouflage. This method of painting murals on canvas like materials and laminating to a prepared surface has been improved greatly with the advent of modern materials. It creates a strong, long lasting mural and allows artist to work continuously through months when weather wouldn’t usually permit. There are numerous benefits to this technique and it has greatly improved the production and efficiency of our work. The Mural Project artists are too many to list because we employ the help of many different groups; from graffiti artist, to volunteers, Warren Wilson students and local “at risk” youth groups etc. Above is a list of our core artist that can be accredited not only with designing and painting for this project, but really giving their hearts and souls to this endeavor. The Asheville Mural Project is Directed by Molly Must and Ian Wilkinson. My mention of the Haymaker Farmer’s Market interest in an art mural on the columns beneath the Haymaker Bridge earlier in the week sparked a fair amount of interest from folks. People seemed to feel that the Market was on to something good and they were letting me know that we (aka the City) needs to do more to promote public art projects like this since art runs deep in Kent’s DNA — both formally with the art education programs and professional galleries like the KSU Gallery and the McKay Bricker Gallery, and at the other end of the spectrum with a glom of indie artists randomly found around town doing their own thing in unexpected places (like streetcorners or at the Professor’s Pub). Our efforts to market the Kent lifestyle is not unique to us — it’s the core of a lot of city development efforts. Those bold Texans in Austin have taken it so far as to proudly adopt the tag line “Keep Austin Wierd” in a national campaign to be the world headquarters of everything odd. You can’t help but admire the lengths they’ve gone to realize their aspiration — the video of the 6′4″ cowboy walking down the street in his raw hide boots and matching thong did me in but clearly they have no fear in embracing their unique sense of style. Another ambitious city that has embraced the off-beat is Asheville North Carolina. They’ve carved themselves a unique place in the mountains of North Carolina that is equal parts hippie and hill-billy – and it works really well. Great art, great street scene, great restaurants and a surprising mix of people of all kinds of dispositions. It turns out that Asheville is one of the sources of inspiration for the Kent art mural project that has been adopted by the Haymaker Farmer’s Market. They’ve got their own infrastructure art thing going on. Kent still has a long way to go to catch Asheville but it’s nice to know that we’re in good company. AMPlight shines: Harper Leich, Steve Lister and Kurt Thaesler paint on the Lexington Avenue mural. Walking from midtown (the nickname I’ve tried and failed to give the land between Merrimon and Broadway, but it never catches) to downtown has gotten a lot different over the years. Used to be, you’d walk past punk/art houses and under the blandy I-240 overpass into what was really just prime hobo territory. Now you’ve got the Pioneer Building and this bright, sparkly mural gracing the concrete of those freeway pillars. That mural is growing larger and bolder even as I type. Three deft painters are working to finish the Lexington side — watch for them up on the scaffolding, bikes parked beneath. And now the Asheville Mural Project has been awarded a $5,000 grant from the small, family Chaddick Foundation. Organizers hope to raise another $5,000 to match that grant and finish both Merrimon Avenue sides. “It’s incredible, so awesome, we’re so grateful,” says Molly Must, AMP’s director, of the grant money. AMP is a giant community project that couldn’t exist without the talent and labor of many artists, and the money from dozens of sponsors. It took years to navigate the red-tape involved in painting a mural on N.C. DOT property, but now even the DOT is singing praise for the project. • If you’ve walked or driven past the project during a summer storm, you may have seen the water pouring off the overpass. A break in the roadway meant water was dousing the mural. AMP has found someone to build flashing and caulk the whole thing to where that should be solved. • After Must took a trip to learn about Philadelphia’s massive, $6 million-per-year mural program, she brought back some tricks for AMP. The Merrimon sides of the project will be created with a new, less-expensive and more collaborative technique that may actually be more durable, too. It involves painting squares of parachute cloth and gluing (OK, it’s really strong glue) to the side of the piers. • The Merrimon murals have more decidedly Asheville themes. One side will be devoted to our local agricultural community, and will focus on the farm-to-market movement and local farmers markets. The other will showcase the chess players in Pritchard Park, including Charles O’Kelley, who plays the outdoors boards every day the sun shines (he shows up playing chess in the movie Searching for Bobby Fisher). • Soon enough, Harper Leich, Kurt Thaesler and Steve Lister will have finished the Lexington side, and the dialogue between the two murals will begin. Check out the drum circle theme that builds between them. • Along with Arts 2 People, the city of Asheville and the Chaddick Foundation, sponsors include the Asheville Downtown Association, Greenlife Grocery, Downtown Asheville Residents Association, Julie Vann, EcoBuilders, Ted Warner, the Lexington Avenue Bizarre Bazaar, Public Interest Projects/The Orange Peel, Rosetta’s Kitchen, Ken Sehested, Jason Rector, Whitt Rylee, On a Roll Screen Printing, Bionic Man Painting, Izzy’s, Henco Graphics, Shanda Christian, Asheville Pizza and Brewing Company, Malaprop’s, Asheville Arts Council, Sherwin Williams, Stephen Jones and Joan Goodman.